What I wonder is: Why does Saturn has such thick and visible rings and a lot of moons? Maybe its rings were much more massive than all the other ones, or maybe what we can see today are some very young rings? I don't know. Well, it depends on where you nuke them, and how you do it. If you put a bomb exactly in the center (if I'm not wrong Phobos has a lot of tunnels/caves inside) I guess some fragments would end up on Mars while some others will stay on the orbit forming some kind of rings or just escape the orbit. Yes. logically this takes some time. Geologic time. What I want to see in SE is not the whole process but the final configuration. 3.- Under the Roche limit no moons can be formed (due to the tidall stresses). Due to Kepler laws the orbits of the grain of dust that are much closer to the planet have a smaller period, little collisions make the disk a viscous system: there is friction between the grains that go fast and the ones that are in little higher orbits. This translate into loss of angular momentum for the faster particles and gain for the slower ones. This means that the orbits of the particles that are closer to Mars shrink, transmiting angular momuntum to the outer parts of the disk (making this other particles go in higher orbits). This happens only near the planet because the third kepler law is a power law, so you have a great change in orbital velocity for a small distance closer to the planet and an insignifican change in orbital velocity for the same small distance farther awar from the planet. So, the effect is that there is a "force" that pushes grains of dust from the inside to the outside, but this force only exists in the regions close to the planet (under the roche limit). The collateral damage of this phenomenon is that the innermost particles fall into the planet quickly. 4.- If your particle is located under the Mars-Synchronous orbit (that where the orbital period matches the martian day) then your particle moves faster than the surface of Mars. The planet, left behind, exerts a dragg on the particle that makes it slow down and thus shrinking it's orbit over millions of years. If you are above the Mars-Synchronous orbit then you move slower than the surface of the planet so the planet pushes you gently and make the radius of your orbit increase (that is the case of the Moon, that recedes 38 mm per year because it's far far away from the geosynchronous orbit). So there is another force that draggs your orbit towards the planet (if you are under the Mars Synchronous orbit) and away from it (if you are located above that orbirt). 5.- So, in Mars there's a point of equilibrium between this two forces (the one that pushes de particles away from the planet by tranfer of angular momentum from the inner parts of the disk and the one that pushes inward from been below the Mars Synchronous orbit). At this place the material of the disk accumulates creating a ring and then compacting more and more the initial debris. If this place is a little above the roche limit (like on Mars), then a moon would star to form (just because the disk has more density here). 6.- This moon, created just above the roche limit, then continues to gain angular momentum due to the gravitational drag of the disk below it (not friction now) so it gets farther. 7.- With the moon there appear orbital resonances. So the outer parts of the disk now have gaps at 3:2 resonance and 2:1 resonance (the strongest ones). 8.- Because the moon gets farther away from the roche limit, because of this gravitational transfer of angular momentum from the disk under the roche limit (6. ), the resonances are gradually displacing outwards. And the gaps are getting bigger. This filters many of the orbits of the grain of dust of the external parts of the disk (if a resonance is or has been in your place then you have to jump or fall to another orbit). This migrating resonances shrink the allowable places for the disk material to exist unperturbed until the gaps have grown so much that the material between them is so compacted that new moons are created preciselly there (above the final location of the resonances). Above the 3:2 resonance final reach the material formed Phobos, and at the 2:1 resonance it formed Deimos (smaller because is farther and the disk has less density here). 9.- Meanwhile, the same 1.-5. process, is giving birth to other moons just above the Roche limit, depleting the disk from material (that has gone to those moons or has fallen to the planet due to the loss of angular momentum). When the disk under the roche limit has gone the transfer of angular momentum is imposibble so all the moons under the Mars-Synchronous orbit start to fall back to the planet (because of 4.). The Moons coalesce and finally traverse the Roche limit, getting disrupted and falling to the planet surface. 10.- Since the final maximum altitude of the 3:2 resonance of the first moon (now destroyed) is under the Mars-Synchronous orbit then Phobos has been losing angular momentum all this time getting closer and closer to the planet until now (that is a few million years until it trepasses the roche limit). The final maximum altitude of the 2:1 resonance (where Deimos formed) was just above the Mars-Synchronous orbit so the effect was the reversed. Deimos has been moving away slowly from the time it formed. 11.- 4 billion years after the giant impact you have Phobos and Deimos located exactly where they are today. Mars 2020. Norwegian technology on board. Yay! If you had the nuke on a certain place on phobos or deimos, would it change the rotation? Bury it on the leading edge so that it blasts a bunch of the moon's mass out prograde, and it will decelerate the moon, lowering the orbit on the far side. Bury it on the trailing edge, and you'll get the reverse. How much of a change it makes is beyond my skill or patience to calculate, especially since we don't know the yield of the bomb or its precise location (or detailed density or composition data for Phobos). But you could just as easily alter the orbit over a long period of time by putting a few solar powered diggers on the surface who continuously scoop up moon-dust and throw it in the appropriate direction of thrust. As long as the dust doesn't settle back on the moon, the momentum transferred between the moon and the dust would be gradually altering its orbit. Hmm. What if you crushed up Phobos and Deimos somehow, how big would the rings be? Would be be as bright or impressive as saturn's rings? Would a new moon form? Or would the rings just go away with time? What would happen if the moon were to be ground up into rings? So the answer is no. Phobos would create a ring the third of a thousandth of those of Saturn. So would it still be visible through a good size telescope (like 114 lcm) ? FFT, those videos and discussion of the formation of the moons is really cool. It's interesting how much we are starting to figure out about the dynamics of migration for the formation and evolution of planetary systems, and moons as well. Steeljaw, the appearance of the rings produced by crushing Phobos or other moons will depend a lot on the size of the particles and how wide the ring is. But a quick computation could be done for the surface mass density of the ring, which gives a rough idea of how impressive it would be. Whether it would form back into a moon depends on the presence of competing forces -- Roche limit, resonance, etc. Mars' crust may be dramatically affecting its atmosphere. 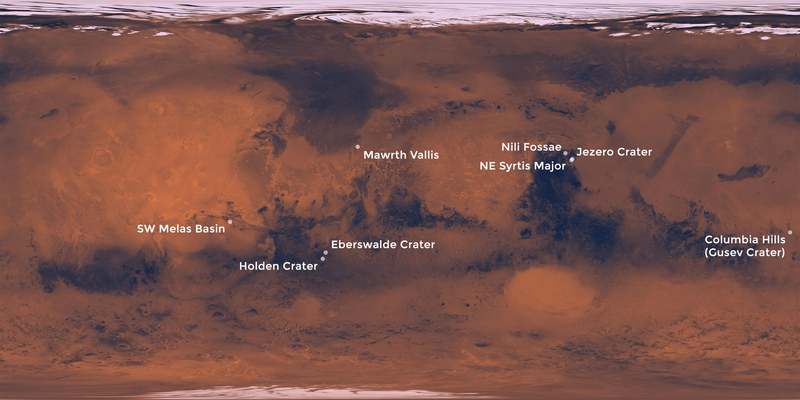 2020 rover suggested landing sites: what do you prefer?